It’s time for another Christmas giveaway! This one is with one of my favorite companies, Baby Clothes (formerly My Baby Clothes Boutique). These beautiful baby clothing items and accessories (such as baby hats and baby headbands) will make a great gift for the baby on your Christmas list (and the giveaway can help you get it for free!). I received the Bonnie Jean Corduroy Ruffled Dress and Pant Set for my review. The outfit is of high quality. I love the colors and, in my opinion, the photos they use on the website represent the outfit in a true light. The colors were just as bright in person as in the pictures. The sizing seems to be spot-on (which is one of the hardest things to determine when you are trying to purchase clothing online). My Baby Clothes also sells some adorable tutus that would make a great piece for your baby to wear for a photograph. I just love infants in tutus! Follow Little People Wealth and My Baby Clothes on facebook and let them know I sent you! The winner will be chosen on Wednesday November 2nd via random.org. The odds of winning depends on the number of entries received and the number of entries you complete.. I will forward the winner’s information to the sponsor who will handle prize fulfillment. The winner will have 48 hours from the time the winner is drawn to contact me to claim their prize. I will notify the winner via the email they use in the comment form. i would purchase an outfit for my daughter!! 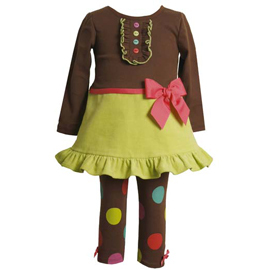 I would pick the mudpie zebra tunic and leggings set. I would defiantly use it on the Bonnie Jean Teal Corduroy Flowered Jumperset. It’s SOOO cute. Everything is so cute. Maybe I would choose a cute little jacket for my daughter for the winter. I would get at least one of the cute little Elf Hats for my little guy! I follow you and My Baby Clothes on facebook. I follow My Baby Clothes on twitter, username sassyluvchic. I subscribe to My Baby Clothes newsletters. I follow your blog via rss with yahoo reader. I signed up for the baby clothes newsletter! Following you and baby clothes on facebook! I follow you on Twitter! AllisaLatham! i would love to win my daughter a christmas tutu by mudpie! thanks for the chance! I would buy my baby a nud pie christmas outfit! I follow you and my baby clothes on fb! I subscribe to My Baby Clothes Boutique’s newsletter! I would probably pick the Good Lad Brown Peacoat and Khaki Pant Set. This is super cute. Thanks for the great giveaway! I follow both LPW and My Baby Clothes on FB! Thanks again. Shared this giveaway in a linky at the Life of Rylie… and Bryce, too! Previous post: The #Lion #King and #Subway Gift Card Winner!